This is not the first time that John H. Lewis and Darrell Burgan have collaborated. 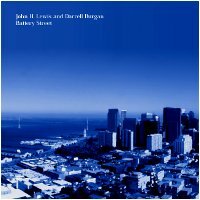 John, an electronic/ambient artist and keyboardist extraordinaire known for his FootFall solo project and his work with pop/rock band Second Story, and Darrell, an ambient artist known for his Palancar solo project and work with ambient groups Copal River and Cluster Balm, had previously released a joint track on one of Darrell's albums in late 2002, and both enjoyed the experience of working together. But never before had they collaborated on a full length release, much less a longform ambient epic; nor had they ever worked on a single piece that took so long to take from conception to completion or demanded so much of their lives to finish. Indeed, the seeds for this collaboration were first sown in early 2003, when the two artists first started chatting casually about the notion that "we should do an album or something". Somewhere along the line they stopped talking about it and started making music. Now, nearly six years later, they have completed the piece that started with just a vague idea tossed around in a chat room, a piece that grew to be a gigantic ambient opus in five movements. The story of this release is really the personal journey that both artists took while putting this album together. The music has been meticulously composed and assembled, with a truly obsessive focus on the details, which might help explain why it took so long for these two artists to finish this one piece. But in the end, Darrell and John feel both the effort and the wait was very well worth it. Both artists sincerely hope that you, the listener, enjoy this music as much as they have enjoyed making it. The album is presented in two forms: the entire piece in one track exactly as the artists originally intended, or as separate tracks for each movement for more convenient listening if the entire piece cannot be heard in one sitting.